A long-range liquid-fuel rocket used by the Germans as a ballistic missile during World War II. Flight altitude - 88 km (55 mi) maximum altitude on long range trajectory, 206 km (128 mi) maximum altitude if launched vertically. The V-2 rocket (German: Vergeltungswaffe 2, retaliation weapon), technical name A4, was a long range ballistic missile that was developed by the end of the Second World War in Nazi Germany. 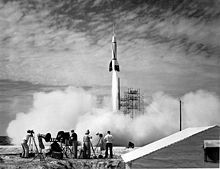 The rocket was the world's first long-range combat-ballistic missile and first human artifact to achieve sub-orbital spaceflight. It was the progenitor of all modern rockets. Over 3,000 V-2s were launched as military rockets by the German Wehrmacht against Allied targets during the war, mostly London and later Antwerp, resulting in the death of an estimated 7,250 military personnel and civilians. The weapon was presented by the Nazi propaganda as a retaliation for the bombers that succeeded in attacking ever more German cities from 1942 until the end of the war. An estimated 20,000 inmates at the Mittelbau-Dora plant died constructing V-2s. Of these, 9,000 died from exhaustion and collapse, 350 were hanged (including 200 executed for acts of sabotage) and the remainder were either shot or died from disease or starvation. In 1919, the Smithsonian Institution published Robert Goddard's groundbreaking work, A Method of Reaching Extreme Altitudes. The report describes Goddard's mathematical theories of rocket flight, including his experiments with solid-fuel rockets. Along with Konstantin Tsiolkovsky's earlier work, The Exploration of Cosmic Space by Means of Reaction Devices (1903), Goddard's work influenced subsequent pioneers, Hermann Oberth and Sergey Korolev. In the late 1920s, a young Wernher von Braun acquired a copy of Hermann Oberth's book, Die Rakete zu den Planetenräumen (The Rocket into Interplanetary Space). Starting in 1930, he attended the Technical University of Berlin, where he assisted Hermann Oberth in liquid-fueled rocket motor tests. Von Braun was working on his creative doctorate when the Nazi Party gained power in Germany. An artillery captain, Walter Dornberger, arranged an Ordnance Department research grant for von Braun, who from then on worked next to Dornberger's existing solid-fuel rocket test site at Kummersdorf. Von Braun's thesis, Construction, Theoretical, and Experimental Solution to the Problem of the Liquid Propellant Rocket (dated 16 April 1934), was kept classified by the German army and was not published until 1960. By the end of 1934, his group had successfully launched two rockets that rose to heights of 2.2 and 3.5 kilometers. Following successes at Kummersdorf with the first two Aggregate series rockets, Wernher von Braun and Walter Riedel began thinking of a much larger rocket in the summer of 1936 based on a projected 25-metric-ton-thrust engine. After the A-4 project was postponed due to unfavorable aerodynamic stability testing of the A-3 in July 1936, von Braun specified the A-4 performance in 1937, and A-4 design and construction was ordered c1938/1939. During 28–30 September 1939, Der Tag der Weisheit (English: the day of wisdom) conference met at Peenemünde to initiate the funding of university research to solve rocket problems. :40 By late 1941, the Army Research Center at Peenemünde possessed the technologies essential to the success of the A-4. The three key technologies for the A-4 were large liquid-fuel rocket engines, supersonic aerodynamics, gyroscopic guidance and rudders in jet control. At the time, Adolf Hitler was not particularly impressed by the V-2; he pointed out that it was merely an artillery shell with a longer range and much higher cost. In early September 1943, von Braun promised the Long-Range Bombardment Commission:224 that the A-4 development was 'practically complete/concluded',:135 but even by the middle of 1944, a complete A-4 parts list was still unavailable. :224 Hitler was probably still not impressed with the weapon but was impressed by the enthusiasm of its developers, and needing a "wonder weapon" to maintain German morale, Hitler authorized its deployment in large numbers. Picture: Schematic diagram of a V-2 rocket. Picture: A U.S. Army cut-away of the V-2. At launch the A-4 propelled itself for up to 65 seconds on its own power, and a program motor controlled the pitch to the specified angle at engine shutdown, from which the rocket continued on a free-fall (ballistic) trajectory. The rocket reached a height of 80 km (50 mi) after shutting off the engine. The V-2 was guided by four external rudders on the tail fins, and four internal graphite vanes at the exit of the motor. The LEV-3 guidance system consisted of two free gyroscopes (a horizon and a vertical) for lateral stabilization, and a PIGA accelerometer to control engine cutoff at a specified velocity. Some later V-2s used "guide beams" (radio signals transmitted from the ground) to navigate towards the target, but the first models used a simple analog computer that adjusted the azimuth for the rocket, and the flying distance was controlled by the timing of the engine cut-off, "Brennschluss", ground controlled by a Doppler system or by different types of on-board integrating accelerometers. The rocket stopped accelerating and soon reached the top of the (approximately parabolic) flight curve. The painting of the operational V-2s was mostly a camouflage ragged pattern with several variations, but at the end of the war a plain olive green rocket also appeared. During tests, the rocket was painted in a characteristic black-and-white chessboard pattern, which aided in determining if the rocket was spinning around its longitudinal axis. Forwarded by 38.000 hp, the rocket reached a maximum speed of appr. 5500 km/h. Two test launches were recovered by the Allies: The Bäckebo Bomb on 13 June 1944 in Sweden and one recovered by Polish resistance on 30 May 1944 from Blizna and transported to the UK during Operation Most III. 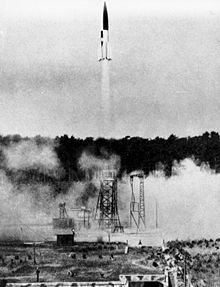 Test launches of V-2 rockets (Aggregate-4) were made at Peenemünde, Blizna and Tuchola Forest, and after the war, at Cuxhaven, White Sands Proving Grounds, Cape Canaveral, and Kapustin Yar. Following Operation Crossbow bombing, initial plans for launching from the massive underground Le Blockhaus and La Coupole or from fixed pads such as near the Chateau du Molay were dropped in favor of mobile launching. Eight main storage dumps were planned and four had been completed by July 1944 (the one at Mery-sur-Oise was begun in August 1943 and completed by February 1944). The missile could be launched practically anywhere, roads running through forests being a particular favorite. The system was so mobile and small that not one Meillerwagen was caught in action by Allied aircraft, although Raymond Baxter reported that he shot at a V2 from his Spitfire as it was launched. An average of ten V-2s were launched per day and up to 1000 V-2s could be launched per month, given sufficient supply of the rockets. Picture: Aftermath of a V-2 bombing at Battersea, London, 27 January 1945. After Hitler's 29 August declaration to begin V-2 attacks as soon as possible, the offensive began on 8 September 1944 with a single launch at Paris, which caused modest damage near Porte d'Italie,:218,220,467. Two more launches by the 485th followed, including one from The Hague against London on the same day at 6:43 p.m.:285 -- the first landed at Chiswick which killed 63-year-old Mrs. Ada Harrison, 3-year-old Rosemary Clarke, and Sapper Bernard Browning on leave from the Royal Engineers. :11 Upon hearing the double-crack of the supersonic rocket (London's first-ever), Duncan Sandys and Reginald Victor Jones looked up from different parts of the city and exclaimed 'That was a rocket! ', and a short while after the double-crack, the sky was filled with the sound of a heavy body rushing through the air. :286 The Germans themselves finally announced the V-2 on 8 November 1944 and only then, on 10 November 1944, did Winston Churchill inform Parliament, and the world, that England had been under rocket attack "for the last few weeks." The final two exploded on (or near) their targets on 27 March 1945. 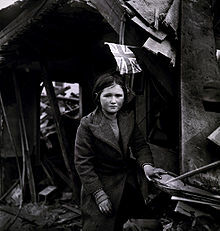 The last British civilian killed was Mrs. Ivy Millichamp, 34, in her home in Elm Grove, Orpington. 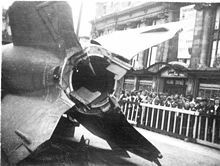 An estimated 2,754 civilians were killed in London by V-2 attacks with another 6,523 injured, which is two people killed per V-2 rocket. However, this understates the potential of the V-2, since many rockets were misdirected and exploded harmlessly. Accuracy increased greatly over the course of the war, particularly on batteries where Leitstrahl-Guide Beam apparatus was installed, with V-2s sometimes landing within meters of the target. Accurately targeted missiles were often devastating, causing large numbers of deaths—about 160 in one explosion in a Woolworth's department store in New Cross, south-east London and 567 deaths in a cinema in Antwerp—and significant damage in the critically important Antwerp docks. Unlike the V-1, the V-2's speed and trajectory made it invulnerable to anti-aircraft guns and fighters, as it dropped from an altitude of 100–110 km (62–68 mi) at up to four times the speed of sound (appr. 3550 km/h). A plan was proposed whereby the missile would be detected by radar, its terminal trajectory calculated, and the area along that trajectory saturated by large-caliber anti-aircraft guns. The plan was dropped after operations research indicated that the likely number of malfunctioning artillery shells falling to the ground would do more damage than the V-2 itself. There is a record of one V-2, fortuitously observed at launch from a passing American B-24 Liberator, being shot down by .50 caliber machine-gun fire. The limitations of any countermeasures can be understood by two facts: 20 seconds after starting, a V2 was out of reach; the time from start to impact in London being merely 3 minutes. On 3 March 1945 the allies attempted to destroy V-2s and launching equipment near The Hague by a large-scale bombardment, but due to navigational errors the Bezuidenhout quarter was destroyed, killing 500 Dutch civilians. The V-2 program was the single most expensive development project of the Third Reich: 6,048 were built, at a cost of approximately 100,000 Reichsmarks each; 3,225 were launched. SS General Hans Kammler, who as an engineer had constructed several concentration camps including Auschwitz, had a reputation for brutality and had originated the idea of using concentration camp prisoners as slave laborers in the rocket program. The V-2 is perhaps the only weapon system to have caused more deaths by its production than its deployment. The production of the fuel3 for one V-2 required 30 tons of potatoes. Sometimes as Germany lacked enough explosives to put in the V-2, concrete was used and sometimes they put in V-2s photographic propaganda of German citizens who had died in allied bombing. The V-2 lacked a proximity fuse, so it could not be set for air burst; it buried itself in the target area before or just as the warhead detonated. This reduced its effectiveness. Furthermore its guidance systems were too primitive to hit specific targets, and its costs were approximately equivalent to four-engined bombers, which were more accurate (though only in a relative sense), had longer ranges, carried many more warheads, and were reusable. Moreover, it diverted resources from other, more effective programs. Nevertheless, it had a considerable psychological effect as, unlike bombing planes or the V1 Flying Bomb, which made a characteristic buzzing sound, the V-2 traveled faster than the speed of sound, with no warning before impact and no possibility of defense. With the war all but lost, regardless of the factory output of conventional weapons, the Nazis resorted to V-weapons as a tenuous last hope to influence the war militarily (hence Antwerp as V-2 target), as an extension of their desire to "punish" their foes and most importantly to give hope to their supporters with their miracle weapon. The V-2 had no effect on the outcome of the war, but its value, despite its overall ineffectiveness, was in its novelty as a weapon which set the stage for the next 50 years of ballistic military rocketry, culminating with ICBMs during the Cold War and modern space exploration. A submarine-towed launch platform was tested successfully, effectively making it the prototype for submarine-launched ballistic missiles. The project codename was Prüfstand XII ("Test stand XII"), sometimes called the rocket U-boat. If deployed, it would have allowed a U-boat to launch V-2 missiles against United States cities, though only with considerable effort (and likely limited effect). While interned after the war by the British at CSDIC camp 11 however, Dornberger was recorded as saying that he had begged the Führer to stop the V-weapon propaganda, because nothing more could be expected from just one ton of explosive. To this Hitler had replied that Dornberger might not expect more but he himself certainly did. Hitler, in July 1944, and Speer, in January 1945, made speeches alluding to a campaign to have U-boats fire "robot" U-1 and U-2 bombs at the U.S. Germany did not possess any capability to fulfill these threats, however. These schemes were met by the Americans with Operation Teardrop. Near the end of the war, German scientists were working on chemical and possibly biological weapons to use in the V-2 program. By this stage, the Germans had produced munitions containing nerve agents sarin, soman and tabun; however, they had never used any of them. At the end of the war, a race began between the United States and the USSR to retrieve as many V-2 rockets and staff as possible. Three hundred trainloads of V-2s and parts were captured and shipped to the United States, and 126 of the principal designers, including both Wernher von Braun and Walter Dornberger were in American hands. Von Braun, his brother Magnus von Braun, and seven others decided to surrender to the United States military (Operation Paperclip) to ensure they were not shot dead by the Nazis as they were prized possessions or be captured by the advancing Soviets. 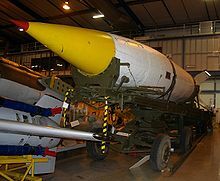 In October 1945, British Operation Backfire assembled a small number of V-2 missiles and launched three of them from a site in northern Germany. The engineers involved had already agreed to move to the US when the test firings were complete. The Backfire report remains the most extensive technical documentation of the rocket, including all support procedures, tailored vehicles and fuel composition. In his book My Father's Son, Canadian author Farley Mowat, then a member of the Canadian Army, claims to have obtained a V-2 rocket in 1945 and shipped it back to Canada, where it is alleged to have ended up in the National Exhibition grounds in Toronto. Post-war V-2s launched in secret from Peenemünde may have been responsible for a curious phenomenon known as Ghost rockets, unexplained objects crossing the skies over Sweden and Finland. The Canadian Arrow, a competitor for the Ansari X Prize, was based on the V-2. The USSR also captured a number of V-2s and staff, letting them set up in Germany for a time. The first work contracts were signed in the middle of 1945. In 1946 (as part of Operation Osoaviakhim) they were obliged to move to Kapustin Yar in the USSR, where Groettrup headed up a group of just under 250 engineers. 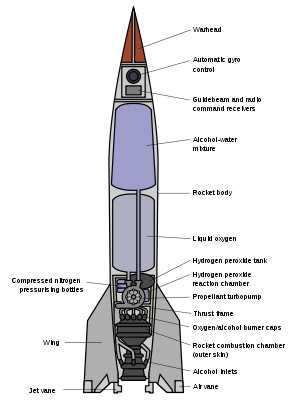 The first Soviet missile was the R-1, an exact copy of the V-2. Most of the German team was sent home after that project, but some remained to do research until as late as 1951. Unbeknownst to the Germans, work immediately began on larger missiles, the R-2 and R-5, based on extension of the V-2 technology. Operation Paperclip recruited German engineers and Special Mission V-2 transported the captured V-2 parts to the United States. At the close of the Second World War, over 300 rail cars filled with V-2 engines, fuselages, propellant tanks, gyroscopes and associated equipment were brought to the railyards in Las Cruces, New Mexico, so they could be placed on trucks and driven to the White Sands Proving Grounds in New Mexico. In addition to V-2 hardware, the U.S. Government delivered German mechanization equations for the V-2 guidance, navigation, and control system, as well as for advanced development concept vehicles, to U.S. defense contractors for analysis. In the 1950s some of these documents were useful to U.S. contractors in developing direction cosine matrix transformations and other inertial navigation architecture concepts that were applied to early U.S. programs such as the Atlas and Minuteman guidance systems as well as the Navy's Subs Inertial Navigation System. A committee[who?] was formed with both military and civilian scientists to review payload proposals for the reassembled V-2 rockets. This led to an eclectic array of experiments that flew on the V-2s and paved the way for American manned space exploration. Devices were sent aloft to sample the air at all levels to determine atmospheric pressures and to see what gases were present. Other instruments measured the level of cosmic radiation. Only 68 percent of the V-2 flights were considered successful. A supposed V-2 launched on 29 May 1947 landed near Juarez, Mexico and was actually a Hermes B-1 vehicle. The U.S. Navy attempted to launch a reassembled German V-2 rocket at sea—one test launch from the aircraft carrier USS Midway was performed on 6 September 1947 as part of the Navy's Operation Sandy. The test launch was a partial success; the V-2 went off the pad, but splashed down in the ocean only some 10 km (6.2 mi) from the carrier. The launch setup on the Midway's carrier deck is notable in that it used foldaway arms to prevent the missile from falling down. The arms pulled away just after the engine ignited, releasing the missile. The setup may look similar to the R-7 launch procedure, but in case of the R-7 the trusses hold full weight of the rocket, not just react to side forces. Picture: US test launch of a Bumper V-2. - Thomas Pynchon makes the V-2 rocket the central point of his postmodern novel Gravity's Rainbow. - The MGM movie Operation Crossbow dramatizes Allied efforts to impede the V-1 and V-2 programs. - Raymond Baxter (a famous RAF WW2 pilot and subsequent TV broadcaster), in an interview about his wartime career, described flying over a V-2 rocket site during a launch, and his wingman firing on the missile: "I dread to think what would have happened if he'd hit the thing!" - The Hugo Award, a science fiction prize, is based on the V-2 missile. Since the 1960s Estes Industries has released several versions of the V-2. Currently there are no Estes V-2s in production. At least 20 V-2s still existed in 2005. - One at the Australian War Memorial, Canberra, including complete Meillerwagen transporter. The rocket has the most complete set of guidance components of all surviving A4s. The Meillerwagen is the most complete of the three examples known to exist. Another A4 was on display at the RAAF Museum at Point Cook outside Melbourne. Both rockets now reside in Canberra. - One example, partly skeletonized, is in the collection of the Netherlands Armymuseum. In this collection are also a launching table and some loose parts, as well as the remains of a V2 that crashed in The Hague immediately after the launch. Picture: A V-2 replica on display in Musée de l'Armée. - One engine at Cité de l'espace in Toulouse. - V-2 display at 'La Coupole' museum, Wizernes, France (Pas de Calais, five kilometers from Saint-Omer). - One (1944, complete) at the Deutsches Museum in Munich (in the centre of the Museum's spiral staircase). - One engine (1944, cut through to reveal technical details) (also at the Deutsches Museum). - One engine at the Museum of Technology in Berlin. - One at the Science Museum, London. - One (painted bright green, and cut through to display the engine and some other interior parts) at the Imperial War Museum, London (on loan from Cranfield University). - Two rockets of the RAF Museum (one at the London site and one at the RAF Cosford site). Exhibits include a Meillerwagen, a Vidalwagen, a Strabo crane, and a firing table with towing dolly. - One (chessboard-painted) at the Kansas Cosmosphere and Space Center in Hutchinson, Kansas. - One at the National Air and Space Museum, Washington, D.C.
- One at the National Museum of the United States Air Force, Dayton, Ohio. - One at the Fort Bliss Air Defense Museum, El Paso, Texas. - One at Marshall Space Flight Center in Huntsville, Alabama. - One at the U.S. Space & Rocket Center in Huntsville, Alabama. - One engine at the Stafford Air & Space Museum in Weatherford, Oklahoma. - One engine at the U.S. Space & Rocket Center in Huntsville, Alabama. - One engine at the Museum of Science and Industry in Chicago. - One rocket body at Picattinny Arsenal in Dover, NJ. - One engine in the Blockhouse building on the Historic Cape Canaveral Tour in Cape Canaveral, Florida. Note 1: The Peenemünde replica incorporates many original components along with remanufactured ones and was put together by a group that included Reinhold Kruger, who worked as an apprentice at Peenemünde during the war. Note 2: The WSMR exhibit is Mittelwerk rocket #FZ04/20919 captured during Special Mission V-2 and is painted with a yellow and black paint scheme of the first successful V-2 launched at WSMR on 10 May 1946. Note 3: The V-2 consumed a third of Nazi Germany's fuel alcohol production and major portions of other critical technologies: 24,000 fighters could have been produced instead of the inaccurate V-weapons. 1. a b Kennedy, Gregory P. (1983). Vengeance Weapon 2: The V-2 Guided Missile. Washington DC: Smithsonian Institution Press. pp. 27, 74. 2. a b c d e f g Neufeld, Michael J (1995). The Rocket and the Reich: Peenemünde and the Coming of the Ballistic Missile Era. New York: The Free Press. pp. 73, 74, 101, 281. 3. Long-range is main feature. See NASA history article. 4. Zaloga, Steven (2003). V-2 Ballistic Missile 1942-52. Reading: Osprey Publishing. p. 3. ISBN 9781841765419. 5. Peenemuende, Walter Dornberger, Moewig, Berlin 1985. ISBN 3-8118-4341-9. 6. NOVA science program(s). Sputnik Declassified. Public Broadcasting Service (PBS). 2008. 7. Hunt, Linda (1991). Secret Agenda: The United States Government, Nazi Scientists, and Project Paperclip, 1945 to 1990. New York: St.Martin's Press. pp. 72–74. ISBN 0-3120-5510-2. 8. Béon, Yves (1997). Planet Dora: A Memoir of the Holocaust and the Birth of the Space Age. translated from the French La planète Dora by Béon & Richard L. Fague. Westview Press, Div. of Harper Collins. pp. (SC) page tbd. ISBN 0-8133-3272-9. 9. a b c Robert Goddard#A Method of Reaching Extreme Altitudes. 10. a b Wernher von Braun#Early life. 11. a b c d e Wernher von Braun#The Prussian rocketeer. 13. a b c d e Ordway, Frederick I, III; Sharpe, Mitchell R. The Rocket Team. Apogee Books Space Series 36. p. 32. 14. a b c d e f g h i j Dornberger, Walter (1952 -- US translation V-2 Viking Press:New York, 1954). V2--Der Schuss ins Weltall. Esslingan: Bechtle Verlag. p. 39. 15. a b c d e f g h Irving, David (1964). The Mare's Nest. London: William Kimber and Co. p. 17. 16. a b Middlebrook, Martin (1982). The Peenemünde Raid: The Night of 17–18 August 1943. New York: Bobs-Merrill. p. 19. 17. Braun, Wernher von (Estate of); Ordway III, Frederick I & Dooling, David Jr. (1985). Space Travel: A History. New York: Harper & Row. p. 45. ISBN 0-06-181898-4. 19. Hakim, Joy (1995). A History of Us: War, Peace and all that Jazz. New York: Oxford University Press. pp. 100–104. ISBN 0-19-509514-6. 21. a b c d Klee, Ernst; Merk, Otto (1963, English translation 1965). The Birth of the Missile:The Secrets of Peenemünde. Hamburg: Gerhard Stalling Verlag. p. 47. 22. a b Johnson (1981/1982). V-1, V-2: Hitler’s Vengeance on London. Stein and Day. p. 100. 23. a b c Pocock, Rowland F (1967). German Guided Missiles of the Second World War. New York: Arco Publishing Company, Inc. pp. 51, 52. 24. Richard Ruggles, R. and H. Brodie (1947) An Empirical Approach to Economic Intelligence in World War II, Journal of the American Statistical Association, 42(237):72-91, March 1947. 25. Jones, R. V. (1978). Most Secret War: British Scientific Intelligence 1939-1945. London: Hamish Hamilton. p. 433. ISBN 0 241 89746 7. 27. Walker, John (27 September 1993). "A Rocket a Day Keeps the High Costs Away". http://www.fourmilab.ch/documents/rocketaday.html. Retrieved 2008-11-14. 29. "Mobile Firing Operations & Locations". V2Rocket.com. http://www.v2rocket.com/start/deployment/mobileoperations.html. 31. Stocker, Jeremy (Nov/Dec 2004). "Missile Defence - Then and Now" (PDF). The Officer Magazine: 34–37. http://www.cdiss.co.uk/Documents/Uploaded/Missile%20Defence%20-%20Then%20and%20Now.pdf. 33. Dyson, Freeman (1979). Disturbing the Universe. Harper & Row. p. 108. http://books.google.com/books?id=RHzoMeU2bxsC&pg=PA108#PPA108,M1. 38. "We Want with the West", Time Magazine, Dec. 9, 1946. 39. "Werner von Braun". http://earthobservatory.nasa.gov/Features/vonBraun/vonbraun_3.php. Retrieved 2009-07-04. 40. Beggs. Beggs Aerospace Post-War V-2 Site "HERMES". http://www.postwarv2.com/index.html Beggs Aerospace Post-War V-2 Site. Retrieved 2008-12-01. 41. Oberg, Jim; Sullivan, Dr. Brian R (original draft) (March 1999). "'Space Power Theory". U.S. Air Force Space Command: Government Printing Office. p. 143. http://space.au.af.mil/books/oberg/. Retrieved 2008-11-28. 42. Harris, Arthur T; Cox, Sebastion (1995). Despatch on War Operations: 23rd February, 1942, to 8th May, 1945. p. xliii. ISBN 071464692X. http://books.google.com/books?hl=en&id=jzzl8wUn52cC. Retrieved 2008-07-04. - Dungan, Tracy D. (2005). V-2: A Combat History of the First Ballistic Missile. Westholme Publishing. ISBN 1-59416-012-0. - Huzel, Dieter K. (ca. 1965). Peenemunde to Canaveral. Prentice Hall Inc.
- King, Benjamin and Timothy J. Kutta (1998). Impact: The History of Germany's V-Weapons in World War II . (Alternately: Impact: An Operational History of Germany's V Weapons in World War II.) Rockville Center, New York: Sarpedon Publishers, 1998. ISBN 1-885119-51-8, ISBN 1-86227-024-4. Da Capo Press; Reprint edition, 2003: ISBN 0-306-81292-4. - Piszkiewicz, Dennis (1995). The Nazi Rocketeers: Dreams of Space and Crimes of War. Westport, Conn.: Praeger. ISBN 0-275-95217-7.